A French Edition of Animal Theology by Professor Andrew Linzey has been published by the French animal protection organisation One Voice. 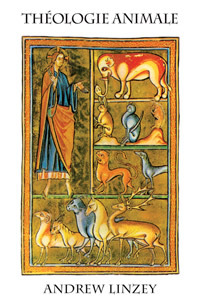 Originally published in 1994 by SCM Press, Animal Theology is widely regarded as the classic introduction to the field, and has also been published by the University of Illinois Press in the US, in Japanese and Spanish editions, and there are Polish and Croatian editions in preparation. The book is most comprehensive treatment of the status of animals from a theological perspective. It argues, inter alia, that human dominion over animals ‘needs to take as its model the Christ-given paradigm of lordship manifest in service’. Victor Hugo would have been proud of this day. This day sees the publication of the first work of animal theology in French. Hugo expounded the ‘great ethic’ — the extension of compassion to all living creatures. He died 125 years ago on 22 May 1885. The time is long overdue for churches to follow Hugo’s lead and support the movement for the protection of animals. Animal Theology shows that there are strong theological grounds to support the cause of justice for animals. One Voice is one of the leading animal protection organisations in France – it holds the torch for a more respectful relationship with animals and deserves our warm support. It is a great honour to be published by them. The book comprises a new Preface written for French readers entitled: ‘La contribution des Français en matière d’éthique animale: René Descartes et Victor Hugo’ [‘The French Contribution to Animal Ethics: René Descartes and Victor Hugo’]. Further details of the French edition are available here and the book can be ordered from One Voice here.